Alcohol intoxication usually leads the next day to a pounding head feeling, nausea, tiredness, irritability, vomiting, dizziness, shakes and diarrhea after a night of drinking to name a few. Shaking the morning after drinking a lot of alcohol may cause unpleasant outcomes both at home and the workplace. Read on to learn more about veisalgia tremors and the ways to stop them. What are the hangover shakes? What is the connection between the hangover and anxiety shakes? How do hangover blood sugar levels cause shakes? What are the signs of the emergency with veisalgia shakes? Hangover tremors are characterized by uncontrollable shaking triggered by alcohol use. The tremors are jerky movements of fingers and hands and can’t be stopped voluntarily. Sometimes the tremors also occur in the eyes, head, and arms, and can even affect the voice. If someone experiences tremors associated with alcohol consumption, they might have a serious problem and should seek a medical opinion regarding treatment options on how to cure hangover shakes, especially if they are combined with throwing up. 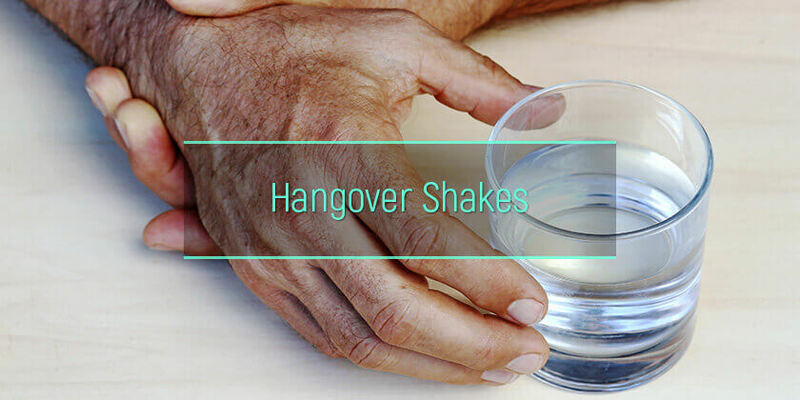 Hangover tremors or hangover shakes are an alcohol withdrawal symptom which leads to rhythmic shaking of certain parts of the body, but particularly the hands. Tremors hangover reflects the effect alcohol has on the parts of the brain that are responsible for controlling muscles. Hangover pain of the muscles and shakes can also be experienced by some people. Since alcohol consumption leads to dehydration, dry skin after drinking alcohol is another common ethanol intoxication symptom. These are all effects of a hangover. But what about the hangover shakes anxiety? That feeling of fear and the hands shaking are alcohol withdrawal symptoms. Experiencing hangover hands shake arises when someone stops drinking after a long period of frequent or heavy alcohol use. It’s one of the major alcohol withdrawal symptoms. In some cases, the shaking is so light that only the person experiencing it notices it, but other times it can be noticed by people around. The hangover tremors happen when alcohol abuse has already changed the nerve cells. Alcohol reduces the brain’s activity by exerting its depressant effects, making the brain neurologically accustomed to this lower level of stimulation. When the person stops drinking, the brain is suddenly flooded with more activity than it is accustomed and ready for. This leads to nervous system hyperactivity symptoms such as tremors or trembling. The frequency and severity of hangover tremors are increased in individuals who consume alcoholic beverages more frequently and in higher amounts. Can a hangover cause a fever and therefore body tremors? Excessive alcohol consumption could sometimes lead to fever, especially at people who are sensitive or have low immunity, but this is not related to the body or hands tremors. Since a hangover is, in fact, a mini alcohol withdrawal, fear, dizziness, confusion and sometimes vomiting bile after drinking come in the same package. However, anxiety is a relatively common symptom, and it is worse for individuals who are already prone to anxiety and panic attacks. What happens is that alcohol increases the effects of gamma-aminobutyric acid or GABA, which is the primary inhibitory neurotransmitter. But the anxiety feeling is reduced only temporarily. People with pre-existing anxiety will experience the feeling coming back in full force or even worse once the alcohol is eliminated from the organism and the brain restores its normal function. Hangover tremors might be a version of enhanced physiological tremor, usually caused by emotional stress and anxiety. Having pre-existing anxiety issues, experiencing a hangover would increase the severity of shaking. Ethanol disrupts the body’s ability to maintain tight control on the blood sugar levels. The result is a low blood sugar concentration, which is the main cause of weakness and fatigue, and even tremors experienced during a hangover. These symptoms of a hangover are very frequent after a night of drinking. Hypoglycemia installs when the liver can no longer release glucose into the bloodstream because it must process alcohol instead. Left untreated, the imbalance in the blood sugar levels can become a severe health issue, possibly leading to uncontrollable tremors. Sometimes, the hangover shakes can be a sign of a more severe condition called delirium tremens or DT. This condition is a neurologic disorder specific to people who undergo alcohol withdrawal. DT can lead to mental confusion, hallucinations, disorientation, seizures, and whole-body tremors. In some cases, the symptoms of DT can progress and lead to a chronic memory disorder, such as Wernicke-Korsakoff syndrome. Because DT is so dangerous, those who develop signs of the condition during withdrawal should be immediately put under medical care. How to get rid of shakes from a hangover? Depending on how severe the shakes are, what helps with the hangover and shakes are rest and taking vitamin B supplements. This also works as a hangover headache cure. In extreme cases, when the tremors won’t go away, they should seek medical advice. There is no silver bullet to stop the hangover shakes, but they should be carefully monitored. The rehabs for alcohol dependent provide the care and support for those in need.